We have a few publications which are free to download and read. Below are the current publications we have available for you to download. The recent case of FirstGroup plc v Paulley has been widely covered in both disability media and the national press. In this legal update, Vivien King sets out the facts of the case, the views of the judges and the implications for service providers. This guidance has been developed in response to evidence from research into the experience of disabled students, commissioned by the Higher Education Funding Council for England (HEFCE) and the Higher Education Funding Council for Wales (HEFCW) during 2008. This research, along with other sources, suggests that there are cases in which students who are blind or partially sighted, deaf or hard of hearing, or within the autistic spectrum are disadvantaged by their campus environment. 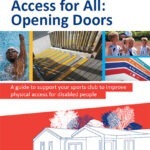 Jean Hewitt, previous Director of the Centre for Accessible Environments, was an author of this report. These guidelines focus on physical access issues because these often pose the greatest challenges as well as opportunities for historic buildings. Other issues such as lighting, tone, colour contrast and signing are touched upon, while acknowledging the excellent guidance on these aspects of good access design which exists elsewhere. Under the Equality Act 2010, all organisations have a duty to provide accessible goods and services. The provision of accessible toilet facilities is a fundamental and crucial part of inclusive service delivery and their design and management warrant careful attention. This factsheet provides an overview of the key issues around provision of accessible toilets including staff training and management recommendations. 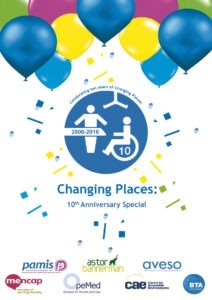 A booklet celebrating the incredible accomplishments of Changing Places campaigners over the past 10 years to have over 840 facilities installed across the UK! A brief history of how the Changing Places specifications were established, and real stories of how access to inclusive WCs has impacted people’s lives. This guidance document is available FREE to download via EFDS. To purchase a printed version, please visit the CAE shop. A new briefing from Habinteg compares the technical specification provided in the 2015 Building Regulations M4 (2), ‘accessible, adaptable dwellings’ with the sixteen design criteria set out in its predecessor, the Lifetime Homes Standard (2011). A new briefing from Habinteg explains recent changes to the ways in which Disabled Facilities Grants funding is organised. It presents evidence on why adaptations are needed and the vital importance of continued DFG funding to support disabled people to live independently. Aveso is a joint sponsorship between Astor-Bannerman and OpeMed. Changing Places is an initiative and campaign across the UK that allows carers, families and loved ones to have access to changing facilities that are both appropriate and promote human dignity. Changing Places are found in locations such as museums, airports, supermarkets, stadia and service stations. The technical, event planning and PR guidance is helpful for organisations, businesses, service providers or potential campaigners interested in getting involved in Changing Places. Towards accessible housing, is an online toolkit for planning policy compiled by Habinteg and the TCPA. The resources within the toolkit aim to help planners, those involved in planning policy and local authorities understand the implications of the new housing standards, support accessibility within planning, and ensure an increased supply of accessible homes. You can access the toolkit via Habinteg’s website where you will also find a free downloadable version. The Inclusive Hotels Network is pleased to present the first of a series of guidance documents about making hotels more inclusive. 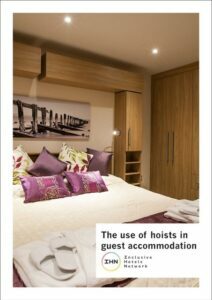 Access to Hotels for People with Hearing Loss provides practical guidance for the hospitality sector to enhance services for all guests, particularly those with hearing loss or hearing impairments. The Inclusive Hotels Network is pleased to present the second document of a series of guidance documents about making hotels more inclusive. The use of hoists in guest accommodation provides practical guidance for the hoteliers to be able to offer accessible and inclusive hotel rooms.